I’m a fangirl, plain and simple. I don’t care how old I get, I will always be one. So that brings me to my next bit of news. 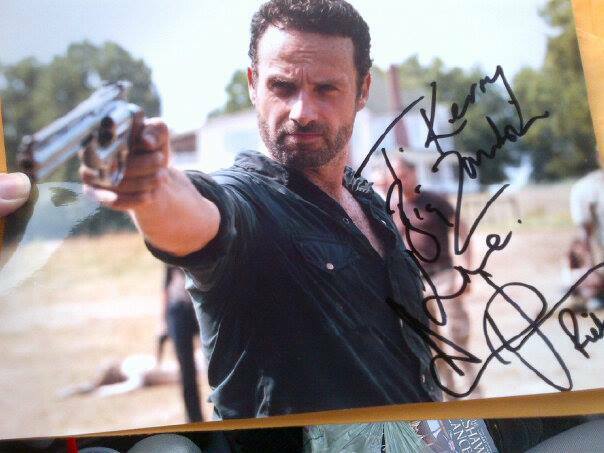 I have yet to meet Andrew Lincoln, who plays Rick Grimes. But writing fan mail has yet again paid off! ‘To Kerry, Big Zombie Love.’ My favorite one this year! I am very stoked with my newest addition. I gave up a bit on getting one. Mr. C got two out of three since he wrote to three addresses available for Andrew. So when he got two back and I got none, I figured that third address was a dud. But apparently not! Do you watch The Walking Dead? Who is your fave character?